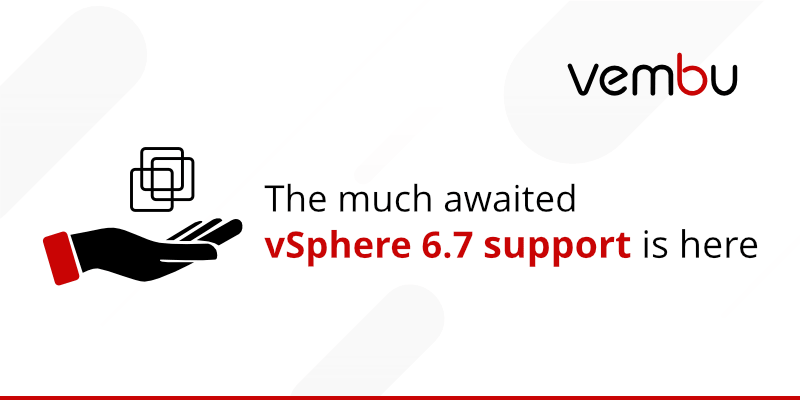 The hottest topic revolving in virtualization in recent times has been about the release of VMware vSphere 6.7. What followed was the increased expectations from the users to get a backup support for vSphere 6.7. While the majority of the backup vendors are scrambling to make progress, we have an update already released to support Backup for vSphere 6.7. Following the release of v3.9.0, the next major update v3.9.1 came about with the launch of Standard Edition being the key highlight. Making Vembu BDR Suite affordable for the businesses of all size, the reach of Vembu drastically improved. VMware 6.7 was announced on 17th of April, 2018. In less than 60 days after the official release, Vembu is geared up to support 6.7. With this latest upgrade, VMware aimed to create a consistent infrastructure for users across all platforms. Increasing the performance by 200 percent and reducing the memory usage by 300 percent, this update from VMware, although minor, serves as a significant improvement for its users. Naturally, people wanted to run their VMs on 6.7, which meant they needed to protect the VMs running on 6.7. With Vembu, users never have to wait for a long time to reap the benefits. We, at Vembu, are proud to announce the release of Vembu BDR Suite 3.9.1 Update 1, the latest flagship offering from Vembu. You can now protect your VMs running on vSphere 6.7 with the enterprise-level features offered in the Vembu BDR. Users can now experience the latest advancements in their VMware hypervisor with vSphere 6.7 while ensuring the protection of their virtual environment with Vembu 3.9.1. The Vembu BDR Suite 3.9.1 Update 1 is now generally available(GA) and ready for download. Along with the support for vSphere 6.7, the latest release comes with numerous enhancements that can simplify the backup process and take the business continuity to next level.